It makes him contemptible to be considered fickle, frivolous, effeminate, mean-spirited, irresolute, from all of which a prince should guard himself as from a rock; and he should endeavor to show in his actions greatness, courage, gravity, and fortitude; and in his private dealings with his subjects let him show that his judgments are irrevocable, and maintain himself in such reputation that no one can hope either to deceive him or to get round him. And, to reduce the matter into a small compass, I say that, on the side of the conspirator, there is nothing but fear, jealousy, prospect of punishment to terrify him; but on the side of the prince there is the majesty of the principality, the laws, the protection of friends and the state to defend him; so that, adding to all these things the popular goodwill, it is impossible that anyone should be so rash as to conspire. For whereas in general the conspirator has to fear before the execution of his plot, in this case he has also to fear the sequel to the crime; because on account of it he has the people for an enemy, and thus cannot hope for any escape. Endless examples could be given on this subject, but I will be content with one, brought to pass within the memory of our fathers. Messer Annibale Bentivogli, who was prince in Bologna (grandfather of the present Annibale), having been murdered by the Canneschi, who had conspired against him, not one of his family survived but Messer Giovanni, who was in childhood: immediately after his assassination the people rose and murdered all the Canneschi. This sprung from the popular goodwill which the house of Bentivogli enjoyed in those days in Bologna; which was so great that, although none remained there after the death of Annibale who was able to rule the state, the Bolognese, having information that there was one of the Bentivogli family in Florence, who up to that time had been considered the son of a blacksmith, sent to Florence for him and gave him the government of their city, and it was ruled by him until Messer Giovanni came in due course to the government. Among the best ordered and governed kingdoms of our times is France, and in it are found many good institutions on which depend the liberty and security of the king; of these the first is the parliament and its authority, because he who founded the kingdom, knowing the ambition of the nobility and their boldness, considered that a bit to their mouths would be necessary to hold them in; and, on the other side, knowing the hatred of the people, founded in fear, against the nobles, he wished to protect them, yet he was not anxious for this to be the particular care of the king; therefore, to take away the reproach which he would be liable to from the nobles for favoring the people, and from the people for favoring the nobles, he set up an arbiter, who should be one who could beat down the great and favor the lesser without reproach to the king. Neither could you have a better or a more prudent arrangement, or a greater source of security to the king and kingdom. From this one can draw another important conclusion that princes ought to leave affairs of reproach to the management of others, and keep those of grace in their own hands. And further, I consider that a prince ought to cherish the nobles, but not so as to make himself hated by the people. 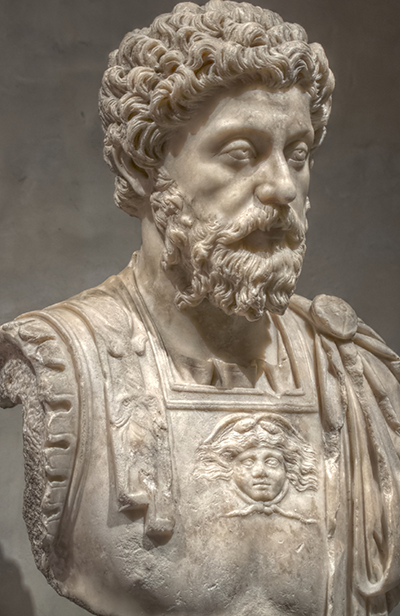 Marcus Aurelius: the last of the widely respected Five Good Emperors. Attribution: Pierre-Selim (Self-photographed) [CC BY-SA 3.0 (http://creativecommons.org/licenses/by-sa/3.0) or CC BY-SA 3.0 (http://creativecommons.org/licenses/by-sa/3.0)], via Wikimedia Commons. After Nerva all 5 enjoyed long reigns. Nerva began adopted Trajan establishing a precedent that was followed by his successors, until Marcus Aurelius. This was the golden age of the Roman Empire. Septimius Severus (193 – 211), who emerged as the winner. Antoninus Caracalla (211 – 217). He ruled briefly with his brother, Geta, who Antoninus killed in 211. There is first to note that, whereas in other principalities the ambition of the nobles and the insolence of the people only have to be contended with, the Roman emperors had a third difficulty in having to put up with the cruelty and avarice of their soldiers, a matter so beset with difficulties that it was the ruin of many; for it was a hard thing to give satisfaction both to soldiers and people; because  the people loved peace, and for this reason they loved the unaspiring prince, whilst  the soldiers loved the warlike prince who was bold, cruel, and rapacious, which qualities they were quite willing he should exercise upon the people, so that they could get double pay and give vent to their own greed and cruelty. Hence it arose that those emperors were always overthrown who, either by birth or training, had no great authority, and most of them, especially those who came new to the principality, recognizing the difficulty of these two opposing humors, were inclined to give satisfaction to the soldiers, caring little about injuring the people. Which course was necessary, because, as princes cannot help being hated by someone, they ought, in the first place, to avoid being hated by everyone, and when they cannot compass this, they ought to endeavor with the utmost diligence to avoid the hatred of the most powerful. Therefore, those emperors who through inexperience had need of special favor adhered more readily to the soldiers than to the people; a course which turned out advantageous to them or not, accordingly as the prince knew how to maintain authority over them. 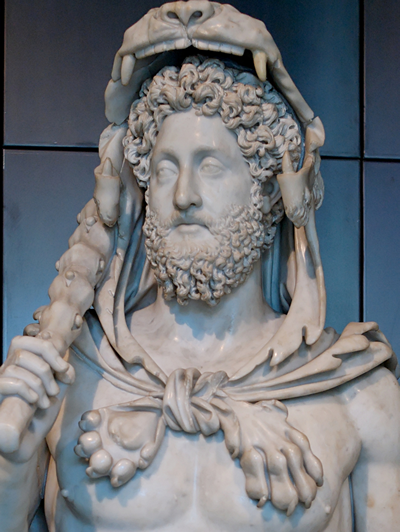 Commodus: useless son of Marcus Aurelius and the first of a long series of emperors who were hated or despised or both. From these causes it arose that Marcus, Pertinax, and Alexander, being all men of modest life, lovers of justice, enemies to cruelty, humane, and benignant, came to a sad end except Marcus; he alone lived and died honored, because he had succeeded to the throne by hereditary title, and owed nothing either to the soldiers or the people; and afterwards, being possessed of many virtues which made him respected, he always kept both orders in their places whilst he lived, and was neither hated nor despised. But Pertinax was created emperor against the wishes of the soldiers, who, being accustomed to live licentiously under Commodus, could not endure the honest life to which Pertinax wished to reduce them; thus, having given cause for hatred, to which hatred there was added contempt for his old age, he was overthrown at the very beginning of his administration. And here it should be noted that hatred is acquired as much by good works as by bad ones, therefore, as I said before, a prince wishing to keep his state is very often forced to do evil; for when that body is corrupt whom you think you have need of to maintain yourself—it may be either the people or the soldiers or the nobles—you have to submit to its humors and to gratify them, and then good works will do you harm. Turning now to the opposite characters of Commodus, Severus, Antoninus Caracalla, and Maximinus, you will find them all cruel and rapacious-men who, to satisfy their soldiers, did not hesitate to commit every kind of iniquity against the people; and all, except Severus, came to a bad end; but in Severus there was so much valor that, keeping the soldiers friendly, although the people were oppressed by him, he reigned successfully; for his valor made him so much admired in the sight of the soldiers and people that the latter were kept in a way astonished and awed and the former respectful and satisfied. And because the actions of this man, as a new prince, were great, I wish to show briefly that he knew well how to counterfeit the fox and the lion, which natures, as I said above, it is necessary for a prince to imitate. Knowing the sloth of the Emperor Julian, he persuaded the army in Slavonia, of which he was captain, that it would be right to go to Rome and avenge the death of Pertinax, who had been killed by the praetorian soldiers; and under this pretext, without appearing to aspire to the throne, he moved the army on Rome, and reached Italy before it was known that he had started. On his arrival at Rome, the Senate, through fear, elected him emperor and killed Julian. After this there remained for Severus, who wished to make himself master of the whole empire, two difficulties; one in Asia, where Niger, head of the Asiatic army, had caused himself to be proclaimed emperor; the other in the west where Albinus was, who also aspired to the throne. And as he considered it dangerous to declare himself hostile to both, he decided to attack Niger and to deceive Albinus. To the latter he wrote that, being elected emperor by the Senate, he was willing to share that dignity with him and sent him the title of Caesar; and, moreover, that the Senate had made Albinus his colleague; which things were accepted by Albinus as true. But after Severus had conquered and killed Niger, and settled oriental affairs, he returned to Rome and complained to the Senate that Albinus, little recognizing the benefits that he had received from him, had by treachery sought to murder him, and for this ingratitude he was compelled to punish him. Afterwards he sought him out in France, and took from him his government and life. He who will, therefore, carefully examine the actions of this man will find him a most valiant lion and a most cunning fox; he will find him feared and respected by everyone, and not hated by the army; and it need not be wondered at that he, a new man, was able to hold the empire so well, because his supreme renown always protected him from that hatred which the people might have conceived against him for his violence. But his son Antoninus was a most eminent man, and had very excellent qualities, which made him admirable in the sight of the people and acceptable to the soldiers, for he was a warlike man, most enduring of fatigue, a despiser of all delicate food and other luxuries, which caused him to be beloved by the armies. Nevertheless, his ferocity and cruelties were so great and so unheard of that, after endless single murders, he killed a large number of the people of Rome and all those of Alexandria. He became hated by the whole world, and also feared by those he had around him, to such an extent that he was murdered in the midst of his army by a centurion. And here it must be noted that such-like deaths, which are deliberately inflicted with a resolved and desperate courage, cannot be avoided by princes, because anyone who does not fear to die can inflict them; but a prince may fear them the less because they are very rare; he has only to be careful not to do any grave injury to those whom he employs or has around him in the service of the state. Antoninus had not taken this care, but had contumeliously killed a brother of that centurion, whom also he daily threatened, yet retained in his bodyguard; which, as it turned out, was a rash thing to do, and proved the emperor's ruin. It remains to discuss the character of Maximinus. He was a very warlike man, and the armies, being disgusted with the effeminacy of Alexander, of whom I have already spoken, killed him and elected Maximinus to the throne. This he did not possess for long, for two things made him hated and despised; the one, his having kept sheep in Thrace, which brought him into contempt (it being well known to all, and considered a great indignity by everyone), and the other, his having at the accession to his dominions deferred going to Rome and taking possession of the imperial seat; he had also gained a reputation for the utmost ferocity by having, through his prefects in Rome and elsewhere in the empire, practiced many cruelties, so that the whole world was moved to anger at the meanness of his birth and to fear at his barbarity. First Africa rebelled, then the Senate with all the people of Rome, and all Italy conspired against him, to which may be added his own army; this latter, besieging Aquileia and meeting with difficulties in taking it, were disgusted with his cruelties, and fearing him less when they found so many against him, murdered him. I do not wish to discuss Heliogabalus, Macrinus, or Julian, who, being thoroughly contemptible, were quickly wiped out; but I will bring this discourse to a conclusion by saying that princes in our times have this difficulty of giving inordinate satisfaction to their soldiers in a far less degree, because, notwithstanding one has to give them some indulgence, that is soon done; none of these princes have armies that are veterans in the governance and administration of provinces, as were the armies of the Roman Empire; and whereas it was then more necessary to give satisfaction to the soldiers than to the people, it is now more necessary to all princes, except the Turk and the Sultan, to satisfy the people rather the soldiers, because the people are the more powerful. From the above I have excepted the Turk [i.e. the Ottomans], who always keeps round him twelve thousand infantry and fifteen thousand cavalry on which depend the security and strength of the kingdom, and it is necessary that, putting aside every consideration for the people, he should keep them his friends. The kingdom of the Sultan [of Egypt] is similar; being entirely in the hands of soldiers, it follows again that, without regard to the people, he must keep them his friends. But you must note that the state of the Sultan is unlike all other principalities, for the reason that it is like the Christian pontificate, which cannot be called either an hereditary or a newly formed principality; because the sons of the old prince are not the heirs, but he who is elected to that position by those who have authority, and the sons remain only noblemen. And this being an ancient custom, it cannot be called a new principality, because there are none of those difficulties in it that are met with in new ones; for although the prince is new, the constitution of the state is old, and it is framed so as to receive him as if he were its hereditary lord. But returning to the subject of our discourse, I say that whoever will consider it will acknowledge that either hatred or contempt has been fatal to the above-named emperors, and it will be recognized also how it happened that, a number of them acting in one way and a number in another, only one in each way came to a happy end and the rest to unhappy ones. Because it would have been useless and dangerous for Pertinax and Alexander, being new princes, to imitate Marcus, who was heir to the principality; and likewise it would have been utterly destructive to Caracalla, Commodus, and Maximinus to have imitated Severus, they not having sufficient valor to enable them to tread in his footsteps. Therefore a prince, new to the principality, cannot imitate the actions of Marcus, nor, again, is it necessary to follow those of Severus, but he ought to take from Severus those parts which are necessary to found his state, and from Marcus those which are proper and glorious to keep a state that may already be stable and firm. Did this slyly smiling character intend parts of this chapter as a subtle critique of principalities? Attribution: Derived from Santi di Tito [Public domain], via Wikimedia Commons. In this chapter, Machiavelli both concludes his discussion of untenable (potentially detrimental virtues) and begins his discussion of the importance of a prince’s reputation. It deals with what a prince should not do, in order to avoid acquiring a reputation that is injurious. In Chapter 20, he will again discuss the importance of popular support. Then in Chapter 21 (a contrast to this chapter), Machiavelli discusses what a prince should do, in order to acquire a reputation that is beneficial. He will then add important details to his depiction of the prince’s reputation in Chapters 22, 23, and 24. This chapter focuses in particular on the role of the prince’s reputation in fostering or preventing conspiracies, and is the longest one in The Prince. In his longer book The Discourses, the discussion of conspiracies also takes up the longest chapter. Here Machiavelli merely covers how the prince can minimize the chances of conspiracies by being neither despised (which invites the attention of predatory rivals), nor hated (which may trigger irrational retaliation of the sort that led the centurion to kill Antoninus Caracalla). In The Discourses, Machiavelli also takes up the problem in a more constructive way, giving guidelines which will help conspirators succeed at their work. Perhaps Machiavelli omitted this helpful advice from the Prince because he had recently been jailed and tortured by the Medici in connection with Boscoli conspiracy, an abortive coup against the newly restored Medici regime. 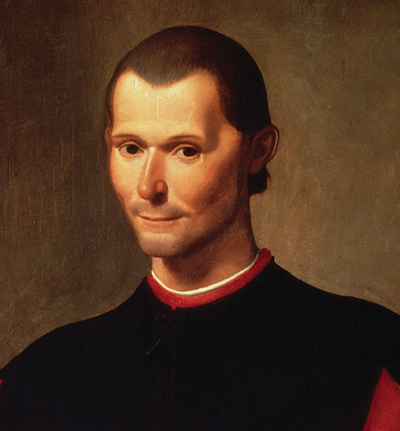 Machiavelli says explicitly here that “a prince wishing to keep his state is very often forced to do evil.” This statement supports the idea that in writing The Prince, Machiavelli had other agendas than simply giving advice to the person to whom he dedicated the book, Lorenzo Di Piero De’ Medici, Duke of Urbino. Machiavelli says repeatedly that a prince must practice calculated cruelty, but he never comes so close to saying as he does here, that this is unfortunate. If we bear in mind that Machiavelli believed that republics were a better alternative, we can reasonably suspect the one of his agendas was to point out that the difficulties of personal rule (especially when dealing with other princes) drives the prince to extremes of calculated cruelty. I do not believe that in writing this book, Machiavelli had, just one and only one purpose, but had several (some partly hidden) agendas. Whether a critique of principalities was among his intentional agendas, passages like this one indicate to me that a critique is, nonetheless present in the text.